Travel tips from the experts — migratory birds! If we were to travel on a long journey, we’d make sure that we have enough warm clothing or carry some extra food. Birds that migrate have natural features that help them in their journeys. A majority of migratory birds have longer and more pointed wings than non-migratory birds or birds with shorter migrations. This aerodynamic wing structure helps to reduce air resistance during flights, thus allowing for more efficient flights. Migrants usually prefer flying in clear weather conditions with a good tailwind (when the wind is blowing in the same direction as the bird’s flight). Many birds prepare for migration by becoming hyperphagic, a condition where due to an alteration in the hormone levels, the bird starts eating a lot of food which gets stored in its body as fat. This excess fat can be used as an energy source during the long journey. Some migrants have been known to almost double their body weight by storing fat in the weeks leading up to the migration! 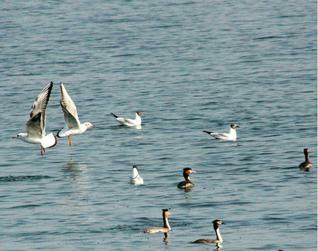 Birds also make frequent stops during migration at stopover sites in order to rest and refuel for the onward journey. Many migratory species exhibit site fidelity , a loyalty towards their past breeding and non-breeding sites; at times even towards their stopover sites. Several birds migrate in large flocks, thus enabling them to reduce their individual energy cost. Classic examples are geese and ducks. Studies have shown that flying in the classic V-formation may be allowing geese to conserve their energy by as much as 12-20% than if they were flying alone. Travelling in a flock also helps reduce the risk of predation while improving the chances of finding food. Hawks and other raptors have figured out the most energy-efficient way of flying using thermals, columns of solar-heated updrafts of warm air that form over land surfaces. Raptors have learnt to soar using these thermal updrafts, rising high into the sky and then soaring down gracefully using another thermal. Flying in this manner helps these birds to conserve valuable energy that might have been lost had they been flapping their wings continuously. While many birds like raptors and flocked migrants migrate during the day, most songbirds migrate during the night. It is believed that the lower temperature and calmer air of the night provide better flying conditions for these birds. Travelling at night may also help avoid predators such as raptors. These songbirds utilize the daylight hours to rest and refuel. 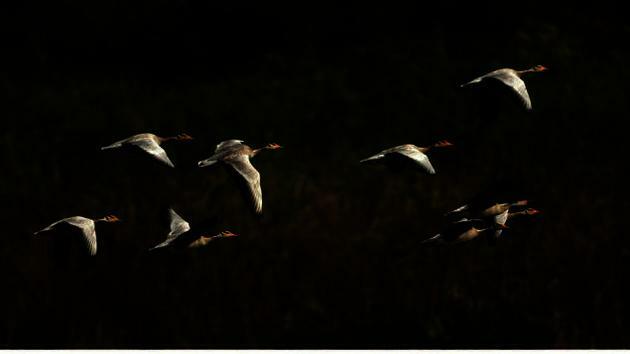 Migratory birds face several threats along their long and arduous journeys. Bad weather and predation are some natural threats, while anthropogenic threats include hunting, trapping, habitat loss, collision with buildings, windows and other man-made structures. Wind farms and power lines have also been known to cause mortalities. Juvenile birds are at greater risk due to their inexperience. Large scale climate change as witnessed in recent years could also be responsible for changes in the timings of bird migrations. Researchers believe that inability of some birds to adapt to rapid climate change may cause a decline in their populations in the near future. Global cooperation is essential for any successful migratory bird research and conservation programme. This article appeared in the Hindu in School on 31 October 2012.